Gilles & Cecilie was invited by Randaberg Kommune and KORO in Norway to participate in a competition to be the main artist for their new Culture House and School. In September 2016 they were announced winners and have since been spending the last year working to develop and installing 8 unique pieces. 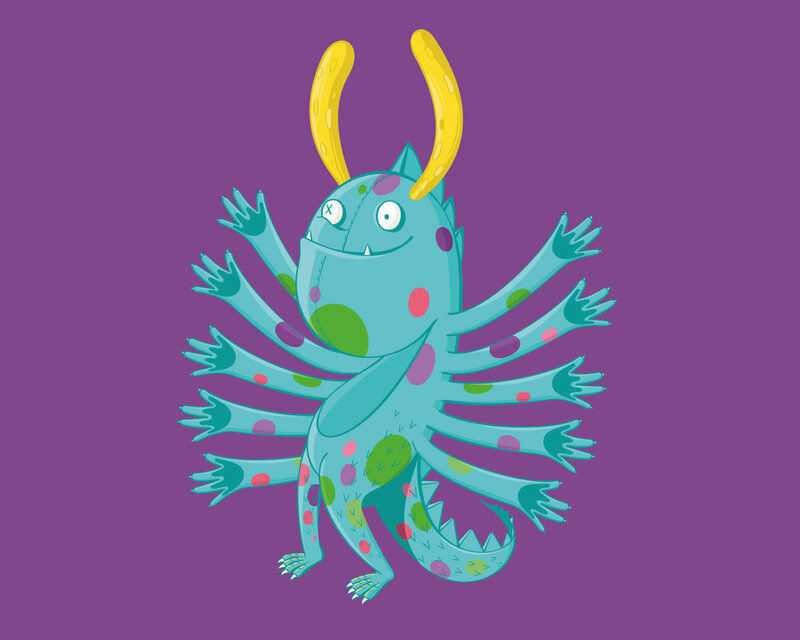 Gilles & Cecilie Studio helped Geometry Agency in Hong Kong to develop a monster character for their new product that motivates children to wash their hands properly to minimise spreading of bacteria. Image by Gilles & Cecilie Studio. Gilles & Cecilie Studio are part of Everything Is Connected, an exhibition curated by Katrin Greiling, currently on show in Milan during the Milan Design Week 2017. Everything is Connected presents contemporary Norwegian craft and design by highlighting their geographical qualities and premises, the connection between production facilities, workshops, material access and innovation, personal networks, logistics and educational programmes. Gilles & Cecilie Studio have designed 2 prints named Utopian City. With love for travelling and discovering new destinations, Gilles & Cecilie Studio pick up the best from each city and build the perfect imaginary place where cities are colorful and harmonic. Having a ball working with dream team Susanne and Marius in TRY to illustrate Ad-Hoc campaigns for Norwegian Air. Commissioned by M Magazine du Monde to create a series of illustrations for their suppliment about vins liquoreux. NEW prints available for sale by Gilles & Cecilie Studio part of the Nordic Archive collection. Proud to be part of the Nordic Archive about to be launched in Tokyo the 17th of November. Mustafa Goes for a Walk wins GOLD in LIA Awards. Thanks to UNICEF and the team in 180la, Bubba's Chop Shop for the great collaboration. Cecilie was invited to be part of panel discussion at Visuelt 2016 to talk about the future role of Grafill. Mustafa Goes for a Walk was awarded Silver Clio Award. Submitted in the Film - Unscripted category. Proud to have been part of dream team for the 13th edition of 100%Norway in London. Curator Max Fraser planned the programme and selected the designers, set designers Hunting & Narudbuilt the set, Zetteler did the press and the show is supported by the Norwegian Embassy and DOGA. Gilles & Cecilie Studio were responsible to create the visual identity for the exhibition: printed and digital matters. 100% Norway runs from today (22nd) until Sunday (25th) at the London Design Fair in the Old Truman Brewery. Gilles & Cecilie Studio have worked with Moleskine for many years providing illustrations, graphic design and events.